Amidst the onslaught of news stories about the 2016 presidential primaries, it is easy to forget that voters in many states will soon be casting primary ballots in races for a variety of other offices. We haven’t yet heard much about incumbents “getting primaried” this year, but that doesn’t mean it isn’t happening. This year’s crop of outsider candidates is likely to draw new voters to the polls in many states, and in the 19 states that hold concurrent presidential and nonpresidential primaries this year these voters will certainly pose a challenge for handicapping congressional and senatorial primary outcomes. This may well be a particular problem for Republican incumbents. We know little about the causes of voter turnout in primaries. Certainly many of those who participate are habitual voters who show up no matter who is on the ballot. But there is also evidence that the composition of the primary electorate is driven by the nature of competition in the races at the top of the ballot. The chart below shows voter turnout for state-level primaries (that is, governor and senator) in states that hold concurrent presidential and nonpresidential primaries and those that do not. The chart shows that there has not always been a difference in the size of the presidential and nonpresidential primary electorates, but it does appear that in the past two competitive primaries (2008 for Democrats and 2012 for Republicans) more people have shown up in primaries where a presidential race is at the top of the ballot. There is at least anecdotal evidence that this disparity can work to the advantage of particular candidates. Many media accounts of the Maryland congressional primaries in 2008, for instance, attributed now-Rep. Donna Edwards’ upset victory over incumbent Democratic Rep. Al Wynn to the surge in African-American primary voting prompted by the opportunity to vote on the same day for Barack Obama. Although most states do not hold concurrent primaries, in 2012 three of the five House incumbents who lost to nonincumbent opponents were running in states with simultaneous presidential and nonpresidential primaries. The primary electorate is, in addition, shaped by the candidates who inspire voter turnout. At this early point in the 2016 presidential race, it seems evident that the candidates who are most likely to excite infrequent voters are the outsider candidates: Donald Trump, Ted Cruz, and to a lesser extent, Bernie Sanders. Many of these voters are unlikely to know very much about their party’s congressional candidates, but if they are predisposed to support nontraditional presidential candidates, there is also the potential that they will back nonincumbents. How will this influence this year’s primaries? On the first three Tuesdays in March, seven states, with a total of 98 House seats, will hold concurrent presidential and congressional primaries. Alabama, Arkansas, and Texas hold primaries on March 1, Mississippians vote on March 8, and Illinois, North Carolina, and Ohio vote on March 15. The March 1 states have also seen above-average levels of competition in House primaries over the past two cycles. In each year, more than 10 House incumbents in Texas faced primary opponents who garnered more than 25% of the vote, and Texas Republicans also had a contentious Senate primary in 2014. Alabama was home to three serious primary challenges in 2012. The March 15 states also have had some recent fireworks in their primaries: Two North Carolina incumbents (Republican Reps. Walter Jones and Renee Ellmers) have faced conservative opponents in both years, and at least one incumbent in Ohio and one in Illinois also faced a well-funded Tea Party opponent in each year. These states, then, already have the potential for more primary conflict than is the norm in other states. It is already clear where these conflicts are likely to be. In Alabama, Sen. Richard Shelby and Rep. Martha Roby, both Republicans, face Tea Party challengers. In Texas, there are no fewer than 14 incumbents with primary opponents on the ballot. Only one of these candidates (Roby’s challenger, local Tea Party activist Becky Gerritson) has attracted very much media attention, and none had more than $50,000 as of the last FEC filing deadline. But money may not matter very much if there is a strong turnout among voters inclined to register a statement against the political establishment. A recent Texas Tribune article summarizing the state’s primary contests did not list a single one of the challenges to Republican incumbents, but the sheer number of primary races this year, as in 2012 and 2014, of course raises the chances that one candidate will break through. It should be noted, however, that all three of the March 1 states use a runoff in races where no candidate has received 50%, so if there are any close calls, these races may well be rerun without the distraction of a presidential primary. The three March 15 states appear, as well, likely to feature a set of primary election options that resembles those of 2012 and 2014. In Ohio, moderate Republican Rep. David Joyce faces a second challenge from conservative Matt Lynch; Joyce received only 55% of the primary vote in 2014 and was aided in that race by large independent expenditures by the U.S. Chamber of Commerce. So far the Chamber has not been active in 2016. In Illinois, veteran downstate Republican Rep. John Shimkus faces a challenge from state Sen. Kyle McCarter. McCarter has support from the Club for Growth, an organization that has traditionally identified a small number of House incumbents to primary and spent lavishly in opposition to them. The club has not yet, however, committed significant funds to the race. North Carolina again features challenges to Ellmers and Jones. It’s likely that many of the infrequent voters who show up because of the presidential primary will just vote in that race and ignore the rest. If anything unusual should transpire in these races, however, there are three potential implications. First, in any given year there is often a race, perhaps a few races, that surprise people. The Eric Cantor challenge in 2014 was one such example, given the lack of attention and financial support Cantor’s opponent, now-Rep. David Brat, received. Should there be an upset in one of these races, particularly from one of the various underfunded challengers in Texas, the presence of Trump voters would likely become part of the story — even if there’s no evidence that these voters changed anything. Second, as I have noted in my book Getting Primaried, the sequential nature of the primaries gives interest groups and Super PACs that have an interest in primary challenges — groups like the Club for Growth — the chance to carefully pick their battles. If an incumbent like Roby or Shimkus ekes out a narrow win against an underfunded opponent, it will make sense for such groups to invest heavily in a high-profile challenge later in the spring. Third, however, candidates and groups who want to make a splash in a primary will have a difficult time getting the public’s attention — voters are likely to be preoccupied by the presidential race, and it will be hard to break through the clutter of presidential ads. And what of the Democrats? Sanders and Hillary Clinton may not represent as much of a challenge to their own party’s orthodoxy as do Trump or Cruz. In addition, as the truism goes, you can’t beat somebody with nobody, and there are not very many Democratic somebodies being challenged. Democrats have had much less interesting primaries than Republicans over the past three election cycles, and the three most prominent instances of Democratic House incumbents being challenged are all in majority-minority districts (one in Chicago and two in Texas). It seems unlikely that the Democratic presidential race will alter the dynamics of these races. The Democrats also have two competitive Senate primaries in the early primary states, in Ohio and Illinois. Again, however, it does not seem likely that the Clinton-Sanders matchup will work to the advantage of any candidate in these primaries. After March 15, there is six-week lull until the next batch of concurrent primaries. Maryland and Pennsylvania — two other states that have seen primary defeats of prominent incumbents in either 2008 and 2012 — vote on April 26, and then, over the subsequent month and a half, Indiana, Nebraska, West Virginia, Kentucky, Oregon, Montana, New Jersey, New Mexico, and South Dakota will hold concurrent primaries for one party or both parties. Additionally, California’s presidential and congressional primaries will also be held concurrently, but the non-presidential “primaries” are top-two contests, where the two candidates who get the most votes advance to the general election, regardless of party. That could help insulate incumbents from ideological challengers. A prolonged Republican presidential nomination battle (or even a Democratic one) may prompt efforts by incumbents or their foes in later states to identify and reach out to voters who they otherwise might not have given much thought to. In short, congressional candidates will, even more than the rest of us, get to know the Trump voters (and maybe the Cruz or Sanders voters) very soon. Notes: *Democrats only; Republicans are holding a presidential caucus on March 5. **California is different from the other states in that it does not hold separate Republican and Democratic primaries for non-presidential, down-ballot contests. Instead, all candidates compete together and the top-two finishers, regardless of party, advance to the general election. Robert Boatright is an Associate Professor of Political Science at Clark University. He is the author or editor of six books, including Getting Primaried: The Causes and Consequences of Congressional Primary Challenges and The Deregulatory Moment? 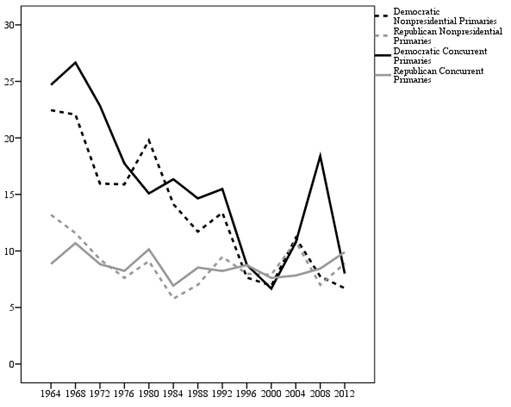 A Comparative Perspective on Changing Campaign Finance Laws.